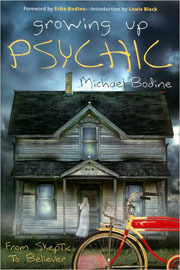 Despite the psychic camps, possessions, ghost busting (well before the movies came out), and his self-destructive tendencies, Michael Bodine somehow comes out the other end a successful psychic, a consultant to the stars (this book features a great introduction by comedian Lewis Black). He eschews any new age-y or spooky clichés, but rather favors blunt assessments, emphasizing his grounded and genuine personality. Michael’s just a normal guy who helps people with his exceptional—and nonreturnable—gifts.